This early airmail cover was mailed from Bogotá, the capital of Colombia. It was sent on a SCADTA hydroplane as requested by the sender. was started in December, 1919, by Germans and Colombians. SCADTA was the first airline in South America and the second in the world. Junkers F-13, one of the earliest passenger planes. The Junkers F-13 outfitted with floats carried this cover. SCADTA operated its own post offices and issued its own stamps. This cover is franked with one of the SCADTA stamps. to use SCADTA airmail services to Colombia. IT SAVES YOU TEN DAYS. I suspect that the American Trading Co. was an agent for SCADTA. 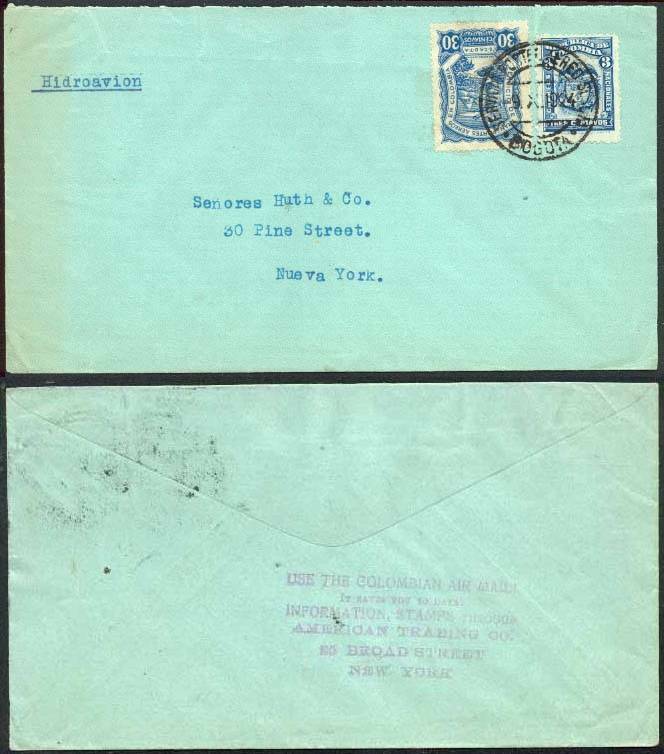 airmail of 1921 (Scott 372 and C29, respectively). SERVICIO POSTAL AEREO SCADTA | BOGOTA CDS.